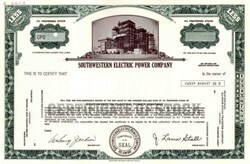 Beautifully engraved SPECIMEN certificate from the Southwestern Electric Power Company. This historic document was printed by the Security-Columbian Banknote Company in 1979 and has an ornate border around it with a vignette of a power plant. This item has the printed signatures of the Company’s President and Secretary and is over 23 years old. The company's service area is industrially diversified with the chemical, petroleum refining, primary metals, and paper industries the predominant users. Economic growth in SWEPCO's service area has been minimal in recent years and so has the growth in the company's electricity sales. However, 1993 electricity sales were 9.5% higher than in 1992 with only a 4.5% increase in customers. The extremely hot summer of 1993 undoubtedly contributed to the increase. SWEPCO's 1993 electricity sales by customer sector as a percentage of total sales of 18,383 million KWH were 22.4% residential, 17.7% commercial, 33.3% industrial, and 26.6% other. 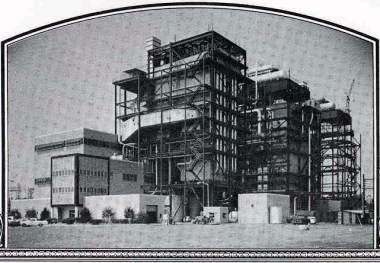 In 1993 the fuel sources for power generated by SWEPCO's plants located in its three-state service area were 16% natural gas, 55% coal, and 29% lignite. The company's 1993 system peak demand occurred on August 18 and was 3,651 MW, up 12.8% from 1992. With a total system generating capability of 4,436 MW at the time of the peak, the capacity reserve margin was 17.7%. No generating unit is under construction or planned. SWEPCO is one of four electric utility operating subsidiaries of Central and South West Corporation (CSW), a Dallas-based public utility holding company. In 1993 the SWEPCO system had 31.5% of the 14,177 MW total generating capability of CSW and accounted for 32.6% of CSW's total system generation of 53,610 million KWH. SWEPCO's Louisiana electricity sales provided 8% of CSW's electric revenues. The four CSW operating companies provide electric service to 1.6 million customers in a widely diversified area covering 152,000 square miles in Arkansas, Louisiana, Oklahoma, and Texas. This area is one of the largest served by any electric utility system in the nation. CSW's business segments are similar to those of Entergy in that they also include gas operations and non-utility energy businesses. Its business plan to improve and expand its core electric utility business and pursue unregulated power projects in other states and outside the U.S. is also similar to Entergy's business plan. At the present time CSW is confining its foreign ventures to Mexico, where it has done business since 1916. The company recently opened an office in Mexico City. It is presently attempting to acquire the bankrupt El Paso Electric Company, whose service area is contiguous to two of CSW's utility subsidiaries and the Mexican border. However, more than 30 parties have filed motions with FERC to intervene in the merger.46 Like Entergy, CSW does not intend to get into businesses unrelated to energy.